ALSO: Registration for Arts and Birding at the Hog Island Audubon Camp in Maine, July 7-12, 2019 opens tomorrow! Spaces tend to fill quickly, so don’t delay if you are hoping to attend (plus, there is an early bird discount)! Standing among sunlit dogwood blossoms is a treat: white petals bright against a backdrop of dappled greens, blue sky, and bird song. The moment would be perfect but for the gnats that bite the back of my neck while sketching. They force me to draw fast and loose and then retreat to the house. 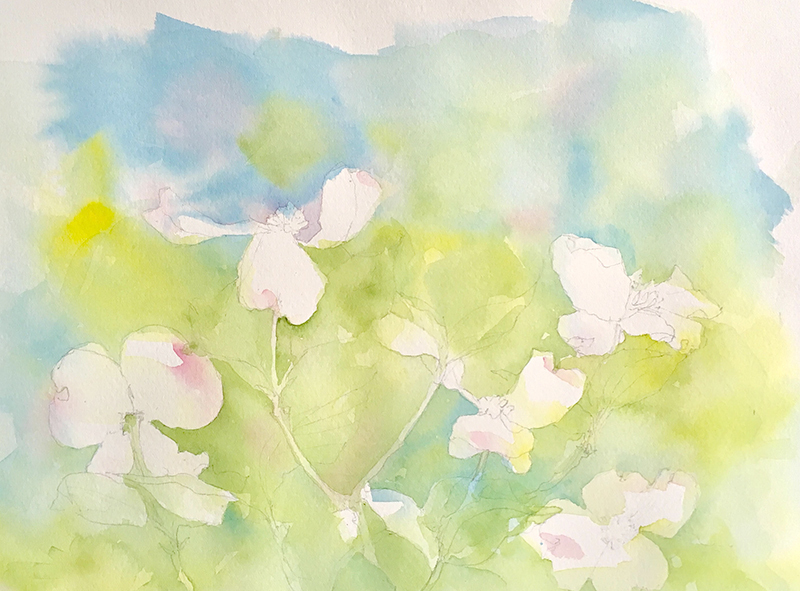 Still, when I look at this painting months or years from now, it will not be the insects I remember, but the long-awaited spring day and the blank sheet of paper bright with promise. 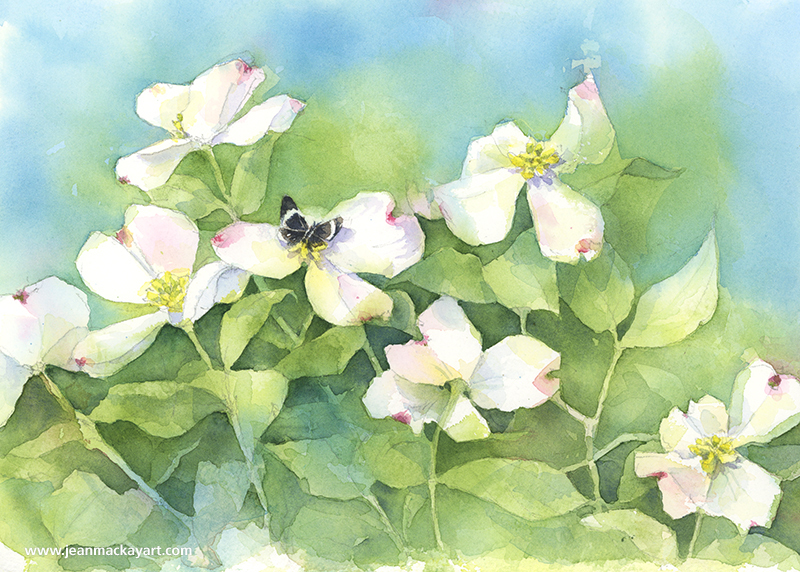 Among Dogwoods, 5×7″, watercolor on Fabriano 300lb cold press watercolor paper. Tips and Techniques– I took advantage of negative painting techniques for this, starting with a wet in wet wash of phthalo blue, Hansa yellow medium, and quin rose over my pencil drawing. I left a lot of white for the flowers, but you can see that I wasn’t exact with every edge. 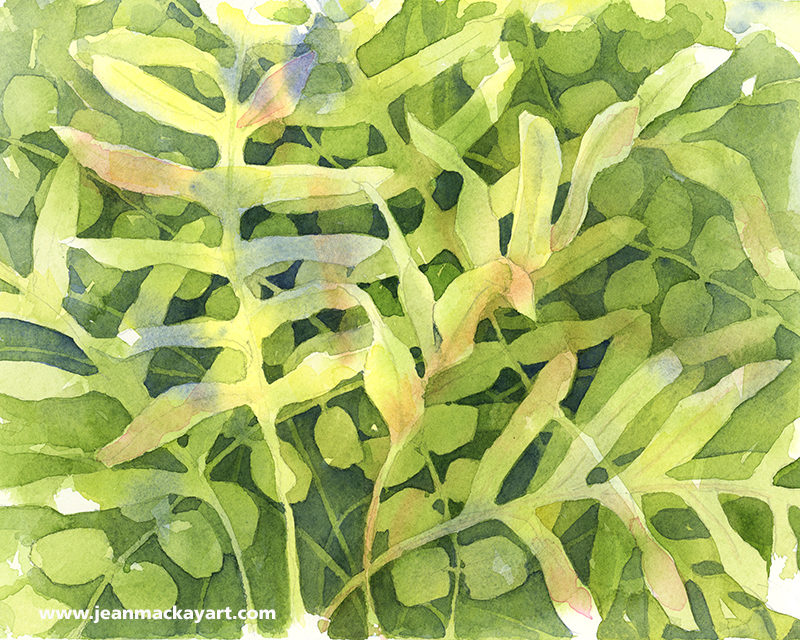 Once dry, I proceeded to do a long series of varied washes to define to foliage and create a sense of depth. 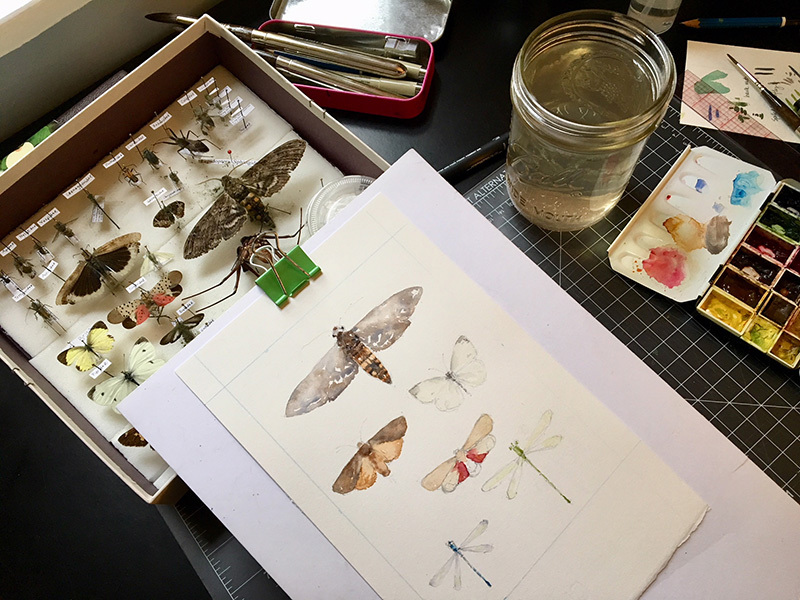 I find that this type of painting takes a while to develop, and doesn’t fully take shape until I add the darkest layers and final details (e.g., the moth, shadows, and red highlights on the flowers). I worked on it over the course of a week. Stepping away is not only important for letting the paint dry between layers, but helps me come back and see it fresh. Here’s a second painting that I started that will give you a sense of what this looks like in the early stages. You can see where I’m just beginning to pick out the shapes from the pencil drawing. Patience is key! I love finding myself at the intersection of art and nature. My passion for those two roads has led me to great places, wonderful people, and to beauty, insight, and mystery. Here, a simple fern in the Lyman Conservatory at Smith College has transported me half a world away to the rain forests of Malaysia. It has made me think about symbiotic relationships and to wish I had taken Latin. It has given me hours of artistic challenge and pleasure. And it has left me both grateful and eager for more. 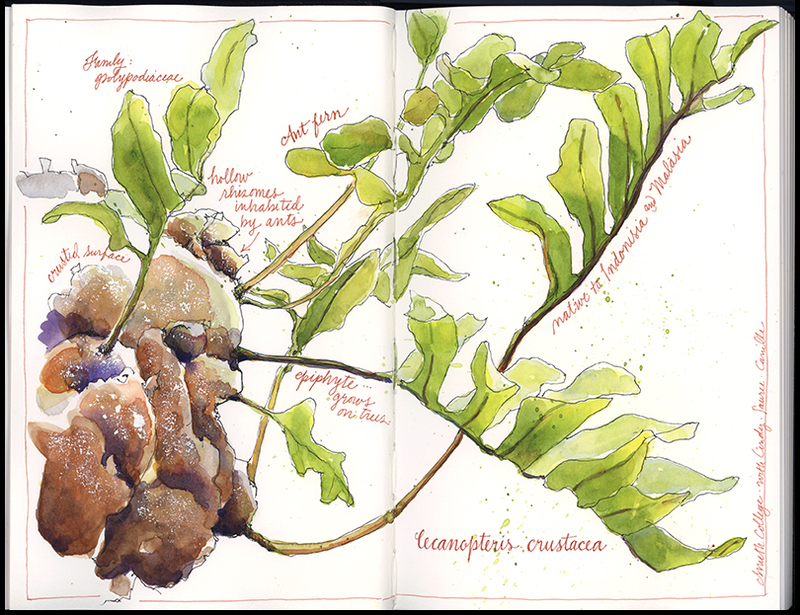 Tips and Techniques: I began these two paintings at the Conservatory, knowing it would be fascinating to take two very different approaches. While layers of paint dried on one, I rotated to the other. I had the major shapes established at closing time and finished both at home. What’s interesting to me is how each conveys such a different part of my experience in the greenhouse: one about being surrounded by layers of greenery, the other about a particularly intriguing fern. 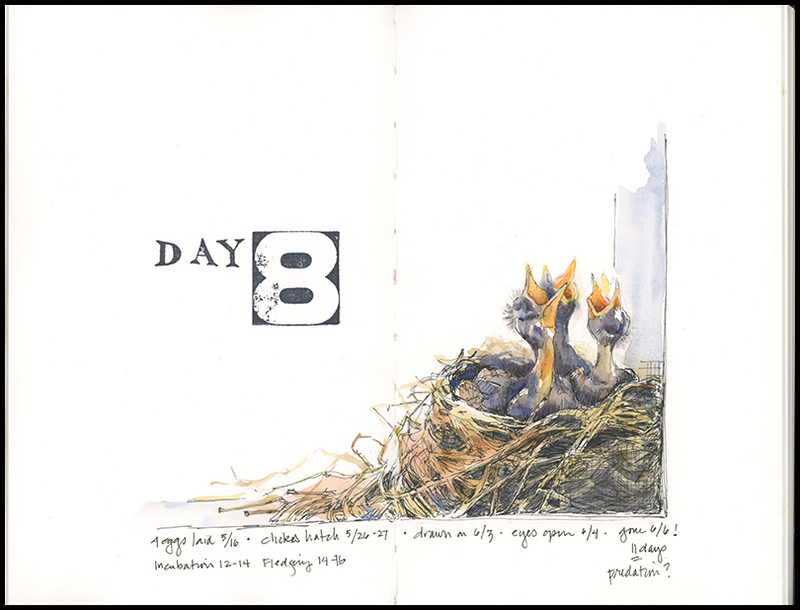 So, if there is a lesson here, it may be to consider what you most want to capture or convey when you begin drawing or painting. In essence, What draws you in? And what techniques are best suited to sharing that? What better time than the dead of winter to play with color? I recently bought a new paint tin from Schmincke (I really just wanted the tin, but decided to get it full instead of empty) and I also received six tubes of QoR watercolors from Golden to try. But before adding any new colors to my palette, I took time this week to test them. What follows is not a brand review, as much as a glimpse into the practice of being a painter. I set about playing with various triads of primary colors with the goal of figuring out which ones looked promising for future paintings. This may sound simple, but given the huge range of colors that you can make from various reds, yellow, and blues, it quickly becomes a complex proposition. I tend to use a limited palette to create color harmonies, so it’s critical for me to have a sense of which combinations work best. After creating a huge mess of test sheets, I recorded the winning triads in my journal. 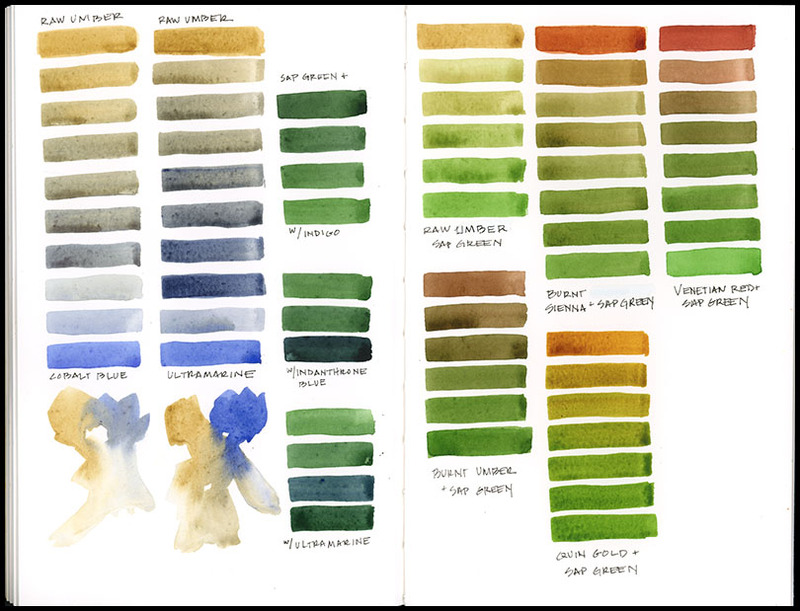 I also needed a refresher on greens, so I created a green page, along with experiments using raw umber (a color I need to get to know better) with cobalt and ultramarine blue (nice blue-grays there, eh?). 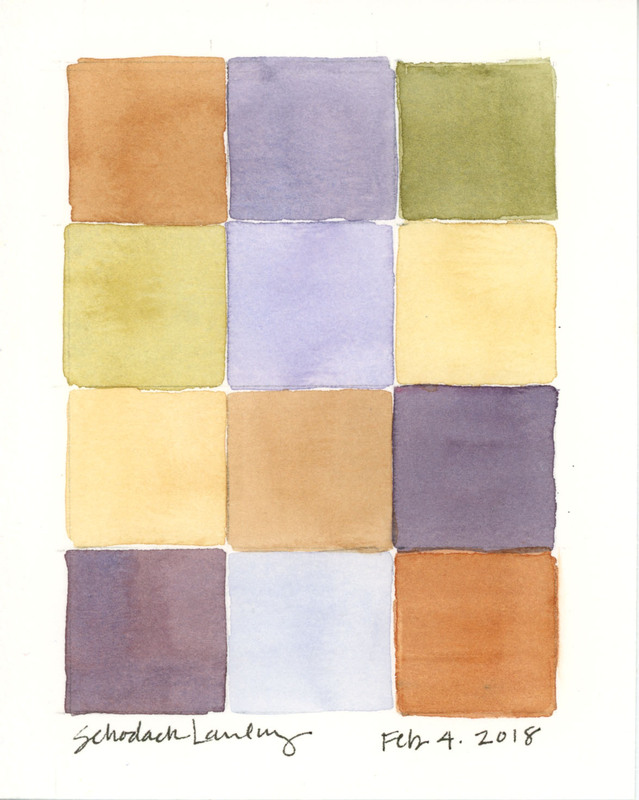 Finally, inspired by Mimi Robinson’s book Local Color, I decided to create a color palette to capture the landscape colors outside my window this morning. 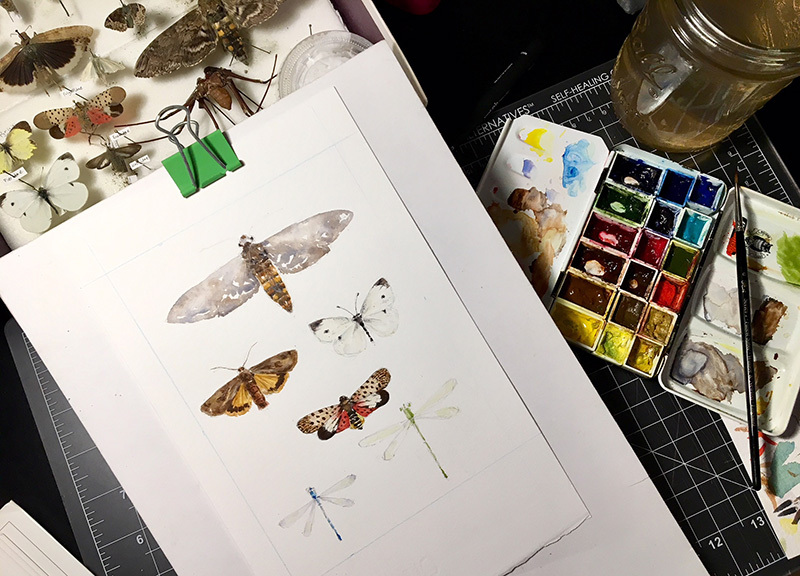 After the week’s riot of color mixing, I was quickly back to subdued hues—but at least I felt confident finding them in my paint box. 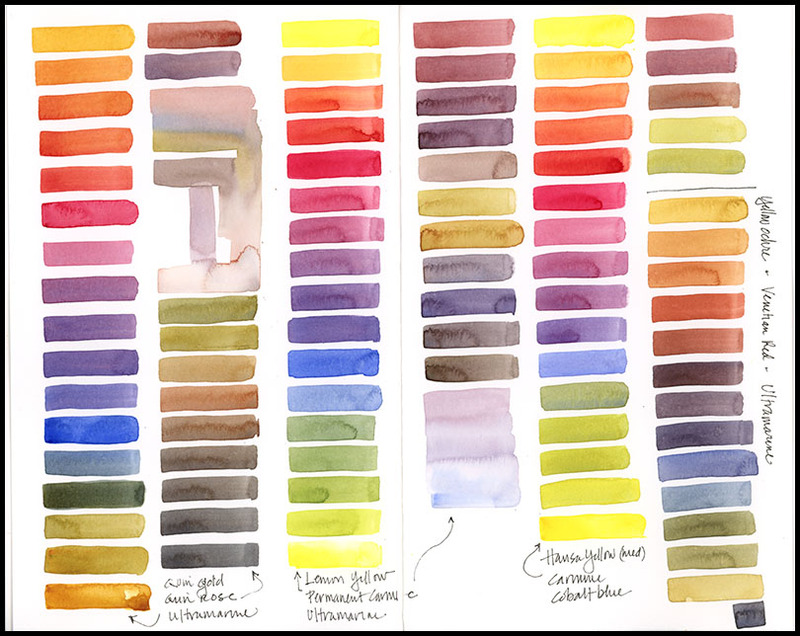 Tips and Techniques– The important takeaway here is not to run out and buy a bunch of new paints or even to copy down the combinations I found most promising. Rather, it is to get to know the paints in your own palette. Taking the time to mix colors and figure out which combinations work best will pay huge dividends when you launch into a painting. 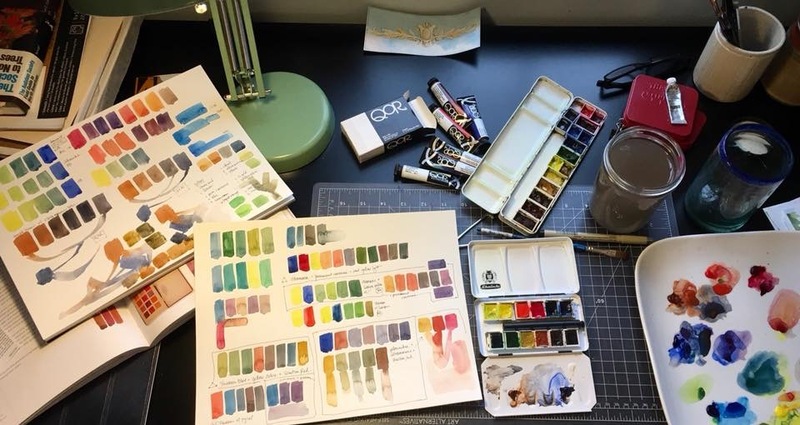 You’ll gain confidence with color mixing, figure out your favorites, and take out little used paints that clutter your box or result in murky mixes. Start with red, yellow and blue mixes. But also try combinations of blues and browns, which will give you lots of lively and interesting grays. Inspired by Robert Frost’s famous poem, I set out to capture a few favorite trees and darkening skies. 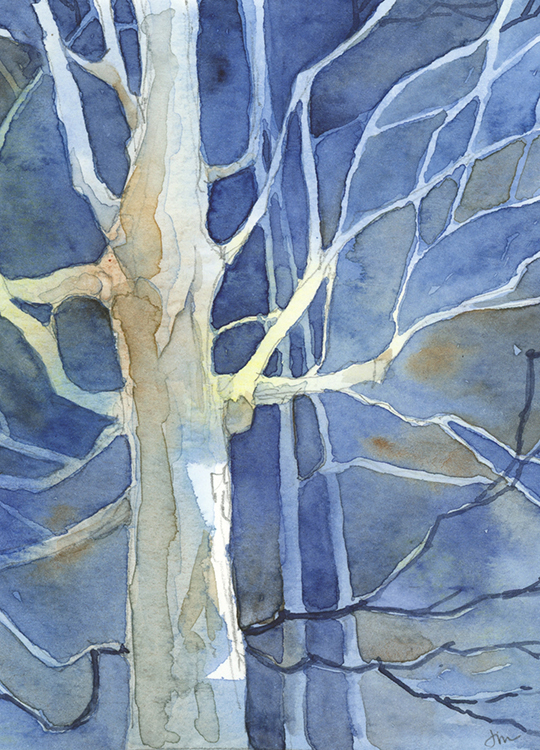 I loved playing with the complexity of branches and shapes using the simplest of colors. There’s something about these deep blues that brings out the mystery and beauty of this time of year. 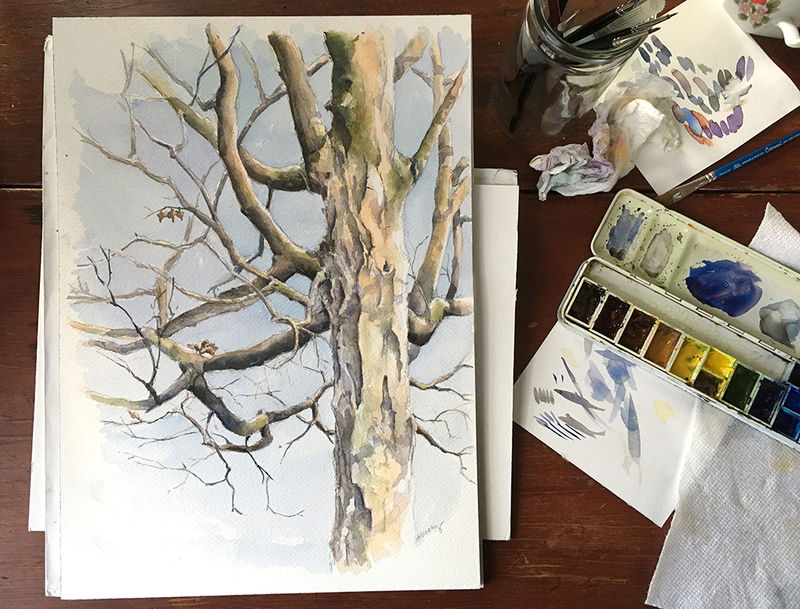 Tips & Techniques– These pieces started with at least six failed attempts to paint trees at night. I began by doing numerous small “test” paintings of silhouetted trees against various skies, but none proved evocative or beautiful. I was ready to throw in the towel when I hit on trying negative painting techniques and finally saw something interesting evolve. So, my tip this week: before investing a lot of time in a big painting, try a few small samples to work out the kinks and test colors. It’s also worth remembering—and I am especially in need of this – sometimes it takes a few failures to get to success. Keep painting! It’s the perfect time of year for painting trees. 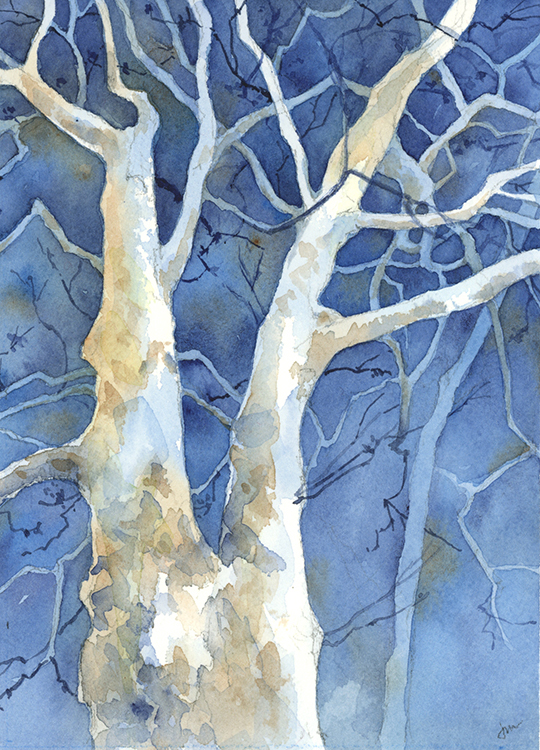 Bare bones and branches, I like the unobstructed view, when limbs, bark, and shapes are revealed. This old maple in my front yard is interesting from almost any angle. 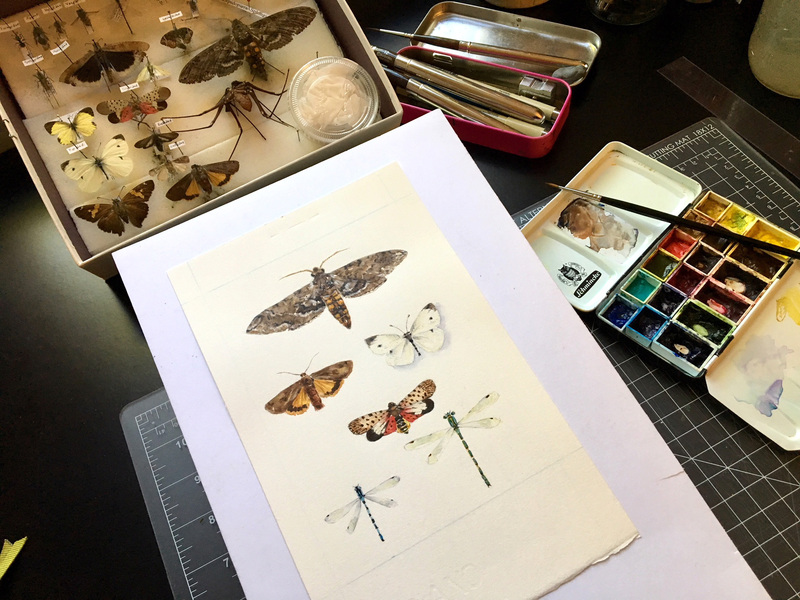 I started mid-afternoon in glowing light but, because the sun faded quickly, it took me several days—and patience waiting for the right light again– to finish.